www.freeitiltraining.com is a site operated by IT Training Zone Limited trading as ITSM Zone (we, our, us). We are a limited company registered in England and Wales under company number 06332305 and have our registered office at Triune Court, Monks Cross Drive, York, England, YO32 9GZ, United Kingdom. Our VAT number is GB 925 9105 19. You are solely responsible for making sure you have sufficient and compatible hardware, software, telecommunications equipment and Internet service necessary for use of the training portal. PC or Laptop running at least Windows 7 or above, or alternatively a MAC computer; minimum specification of 128 MB (256MB recommended) RAM and a minimum of a 500MHz Processor. Minimum Screen Display Size of 15” (17” widescreen or above recommended). Headphones or speakers connected to your computer – to listen to video tutorials. A Web Browser (IE 8 and above or Firefox) with Adobe Flash Player installed. (Flash Player 10 recommended). A reliable Internet connection of at least 1 Mbps – to view video tutorials. We are the owner or the licensee of all intellectual property rights in our site, and in the material published on it unless otherwise stated. Those works are protected by copyright laws and treaties around the world. All such rights are reserved. 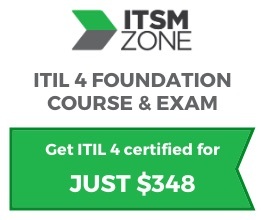 Commentary and other materials posted on our site are provided solely for the purpose of providing information about ITSM Zone and its products and services. Whilst we have taken reasonable care in the preparation of the contents of our site, our site and all its contents are provided on an “as is” basis. We do not warrant the accuracy, completeness or usefulness of any information contained on our site. We disclaim all liability and responsibility arising from any reliance placed on such materials by any visitor to our site, or by anyone who may be informed of any of its contents. Details of products and services posted on our site are subject to change without notice. All products and services are subject to availability. By using our site, you understand and agree we are not responsible for the structure, content, format and associated costs of the official qualification scheme and therefore elements of the scheme including but not limited to exam formats and durations, exam proctoring rules and methods, exam costs, syllabus requirements and the contents of courses as defined within the official qualifications scheme may change from time to time. In such cases we will respond to all reasonable changes as necessary within a reasonable time. We provide online products, services and training courses and materials for the benefit of our customers and registered users. Not to use more than one free dashboard. Not to operate any free dashboard otherwise than in a fair and reasonable way that does not materially limit or impact the delivery of service and products to other users of our site. Not to allow others to use any user identification code, password or any other piece of information you choose, or you are provided with as part of our security procedures. We will determine, in our discretion, whether your use of our site is fair use. When unfair use has occurred, we may take such action as we deem appropriate. We exclude liability for actions taken in response to breaches of this fair use section. The responses described in this section are not limited, and we may take any other action we reasonably deem appropriate. The website from which you are linking must comply in all respects with the content standards set out in our fair and acceptable use policy (see above). ITIL® is a registered trade marks of AXELOS Ltd, used under permission of AXELOS Limited. All rights reserved.